This recipe has made it up here solely by popular acclaim. 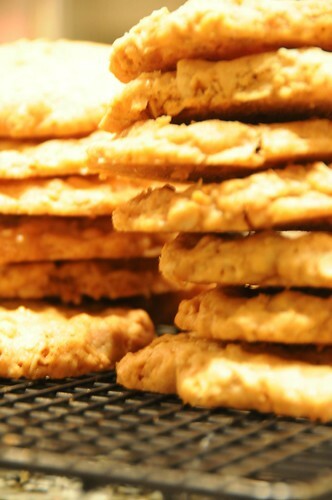 When I first made it, I was pretty surprised: the cookies are thick but crunchy, very sweet and very buttery all at once. I was ready to file the whole thing away as an interesting experiment when I brought them to a baby shower — which, possibly predictably, turned out to be full of people who love thick, crunchy, sweet, buttery cookies. So if you make these and love them, you have my friend’s baby to thank for it. When I bake cookies, I put one rack in the top third of my oven and one in the bottom third. I put in two sheets of cookies at a time, and halfway through, I rotate them, switching racks and turning the back to the front. I have never, as far as I can remember had cookies fail because of this brief exposure to room-temperature air, so I recommend it as a way to get twice as many done in one batch! Preheat oven to 350 F. Line two baking sheets with parchment paper or silicone liners. Soften the butter (either by organizedly leaving it out overnight or in the microwave) and cream it with the brown and white sugars. Add the egg and vanilla. Then mix in the flour, leavening, and salt and mix to combine. Finally, add the oats and white chocolate and stir until they’re evenly distributed. 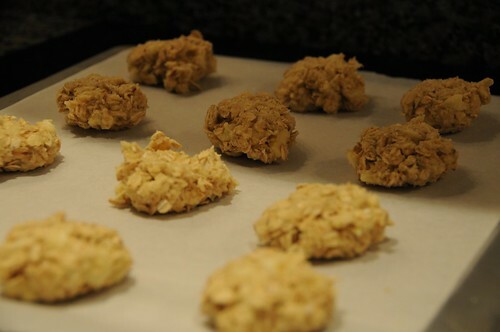 Form fairly big cookies — the balls of dough should be close to two inches in diameter — and place them on the cookie sheets, smushing them slightly with your hands or a spoon. Bake 14-18 minutes until golden brown, rotating the sheets halfway through. Let cool for a minute before removing them to a cooling rack. Exercise caution when transporting these cookies, as they are prone to crumbling if not handled gently. *Normally I don’t respect light brown sugar and dark brown sugar as different entities, but in this case, the cookies themselves are very light in color, so the light brown sugar preserves both that and the crispiness. **Old-fashioned oats are your best bet, but quick-cooking work too.